As single mode of observation or modelling cannot provide complete or adequate information for air quality and climate change, we focus on integration of satellite remote sensing observations with multi-scale modelling. The aim of this work is to evaluate the potential of using ground-based, airborne and space-based measurements and to gain insight into the factors controlling air quality on multiple scales and the interaction with climate change. The outcomes of the work lead directly to improved model simulations for prognostic and diagnostic applications. Read the sections below to find out more about our recent and current work. Radiative properties of aerosols are still uncertain due to limited information on size, composition and origin (natural or anthropogenic). This topic addresses the uncertainties in climate forcing assessment by global model and satellite observation. The direct and indirect radiative effects of aerosols on regional and global climate change are very important. We have used satellite data to derive the aerosol radiative properties such as optical depth, single scattering albedo and asymmetry factor. The impact of absorbing aerosols on solar heating rate is being studied with detailed optical properties of aerosols. Also, we have used models (radiative transfer model, global or regional models) to calculate the radiative properties of aerosols and quantify the climate forcing of aerosols. This figure shows the direct radiative forcing (W/m2) of sulphate aerosols. We found three regions of high values in East Asia, North America and Europe. The uncertainty in assessment of aerosol forcing comes from microphysical properties such as the chemical composition, size distribution and shape of particles in addition to the optical properties for radiative transfer calculation. This topic is focused on the combination of satellite and modelling data. We use global simulations and observations to examine the initial and boundary conditions for mesoscale modelling. 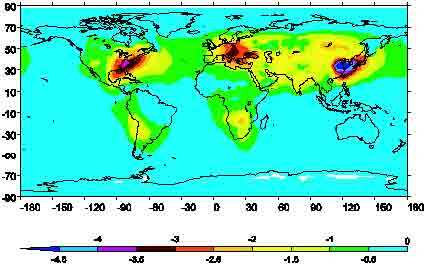 The global distribution of aerosols and trace gases are being investigated with use of satellite measurements to retrieve the concentration of NO2, SO2, O3 and Particulate Matter (PM). The optical and microphysical properties of aerosol and trace gases are very important for air quality monitoring and forecast. We have focused on global retrieval of aerosol properties such as chemical composition, size distribution, and morphology. The concentration of trace gases such as NO2, SO2 and O3 can be determined by the radiance measured by satellite instrument, when constrained by data from a global model. 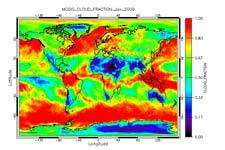 Also we validate the regional modelling simulation by using satellite, airborne and ground-based observational data. We are using satellite data with high resolution to study particular air pollution episodes such as urban haze, forest fires and dust storms. Furthermore, we are investigating the potential of using regional air quality model (CMAQ) with global model (GEOS-Chem), when combined with observational data. We are using the interface between GEOS-Chem and CMAQ (developed by the US EPA) to study the interaction between regional and global scales. 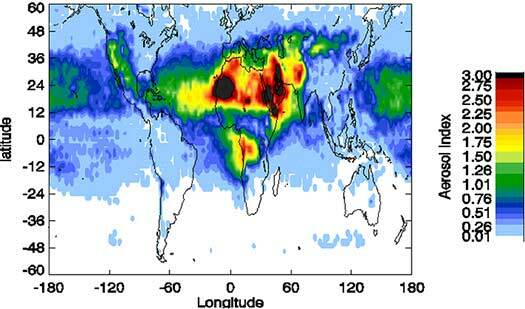 Currently, we are using GEOS-Chem to examine the distribution of PM2.5 over the main regions of the world. This figure (above) presents PM2.5 concentration retrieved from MODIS and MISR data, when constrained by vertical profiles of PM2.5 from GEOS-CHEM. High values of PM2.5 are found over Eastern Europe, Eastern United States, and surrounding areas of Saharian region, associated with biomass burning, industrial pollution and dust storms. A 3-day forecast of Air pollutants including Ozone (O3), Nitrogen Oxides (NOx) and Particulate Matter (PM2.5) designed for use by the scientific community for Air Quality research.